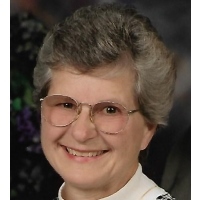 Barbara Ellen (Loflin) Rathbun, age 85, of Leon, Kansas, passed away on February 10, 2019. Born on April 14, 1933 in Hays, Kansas, she was the daughter of Clifford John and Catherine Barbara (Breit) Loflin. She was raised on a farm near Ogallah, Kansas and graduated from Ellis High School, Ellis, Kansas in 1951. Barb was united in marriage to Alfred “Al” A. Rathbun on June 17, 1951 in Ellis, Kansas. The couple lived in Kirwin, Kansas, Superior, Nebraska, Stockton, Kansas, Eureka, Kansas, Winfield, Kansas and Leon, Kansas. Barb worked as a secretary for a CPA in Eureka. She worked as a secretary at the Winfield High School and later as a bookkeeper doing the payroll at the Administration Building for Winfield School District. She worked as a bookkeeper for the El Dorado School District and Clerk of the Board, as well. Barb and Al were members of the Jeeps Motorcycle Club when their sons raced motorcycles there. Barb and Al also enjoyed traveling on their motorcycles in the US and also made several trips to old Mexico with a group of people on motorcycles. When Barb and Al retired, they enjoyed traveling to Arizona and New Mexico in their 5th wheel trailer. They also enjoyed going to Canada during the summer to go fishing. Barb also started doing cross-stitching when she retired. She loved to read and she worked part time at the Leon Library. Barb is survived by her husband, Al of Leon, Kansas; their sons, Doug and wife, Diana, Dave and wife, Mary all of Winfield, Kansas; grandchildren, Amy and husband, David, Josh and wife, Lynsey, Jill, Abbi and husband, Aaron; brother, John Loflin; sister, Marge Miller and eight great grandchildren. Barb is preceded in death by her parents and an infant great grandson. Visitation will be on Thursday, February 14, 2019 from 12:00-2:00 P.M. at Carlson Colonial Funeral Home in El Dorado, Kansas where services will follow at 2:00 P.M.
A memorial has been established in Barb’s name with the Leon Library. Contributions can be made through Carlson Colonial Funeral Home. Please sign her online guestbook and leave a memory of Barb at www.carlsoncolonial.com.